(0 Customer Reviews) | Write Review 9 issues per year My Weekly Special magazine is the perfect accompaniment to My Weekly! The Specials are packed full with all the exciting stories and features that our readers enjoy! 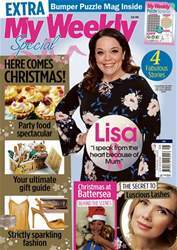 There will be interviews with your favourite celebrities, real life stories, fun puzzles, up-to-date fashion and beauty news, and great cookery for you to try. Features, fiction, celebrities, cookery, travel, health, home and style, and much more besides. My Weekly Special magazine is the perfect accompaniment to My Weekly! You'll receive 9 issues during a 1 year My Weekly Special magazine subscription. You'll receive 9 issues during a 1 year My Weekly Special magazine print subscription.